U.S. President Barack Obama (L) attends a press conference with Vietnam's President Tran Dai Quang at the Presidential Palace Compound in Hanoi, Vietnam, May 23, 2016. 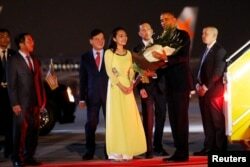 U.S. President Barack Obama will give a speech Tuesday in Hanoi expected to focus on improved relations between the United States and Vietnam and the need for constructive dialogue between the two countries. White House officials say the president will emphasize the importance of the two nations engaging in meaningful talks when they disagree, including on human rights. Obama also will meet Tuesday with civil society activists, as well as young entrepreneurs. Human rights groups say Obama has been too quick to overlook rights abuses in his push to establish warmer relations with Vietnam. On Monday, he announced that the United States is lifting its long-standing weapons ban on Vietnam. Speaking at a news conference with Vietnamese President Tran Dai Quang, Obama said "the United States is fully lifting the ban on sale of military equipment to Vietnam that's been in place for some 50 years," adding "sales will need to still meet strict requirements, including those on human rights, but this change ensures Vietnam has access to equipment it needs to defend itself." Quang welcomed the move as an end to a "painful chapter." Responding to a reporter’s question about increased Chinese aggression in the region, Obama said the decision was not based on China. He said it was based on the desire to complete a long process that began decades ago by many veterans of the Vietnam War, including he said, former prisoner of war, Republican Senator John McCain. China reacted cautiously to the announcement Monday. Foreign Ministry spokeswoman Hua Chuying said, "As a close neighbor to Vietnam, we welcome normal and cooperative relationship between Vietnam and other countries, and we certainly hope such development of bilateral relations is conducive to regional peace and security." Obama said the U.S. and Vietnam still have differences over human rights, and that each individual weapons sale will be reviewed on a case-by-case basis. But he said the time is right to lift a “blanket ban” based on an ideological division. He cited a new level of trust and dialogue between the militaries of the two countries, and signaled there may be more U.S. ships coming to port in Vietnam “at the invitation” of the Hanoi government. U.S. President Barack Obama receives flowers as he arrives at Noibai International Airport in Hanoi, Vietnam, May 22, 2016. The two leaders also announced new business deals amounting to $16 billion.